Exactly what I expected. They're adorable in my daughter's room! Show off your whimsical style with this 3-piece quilt set. 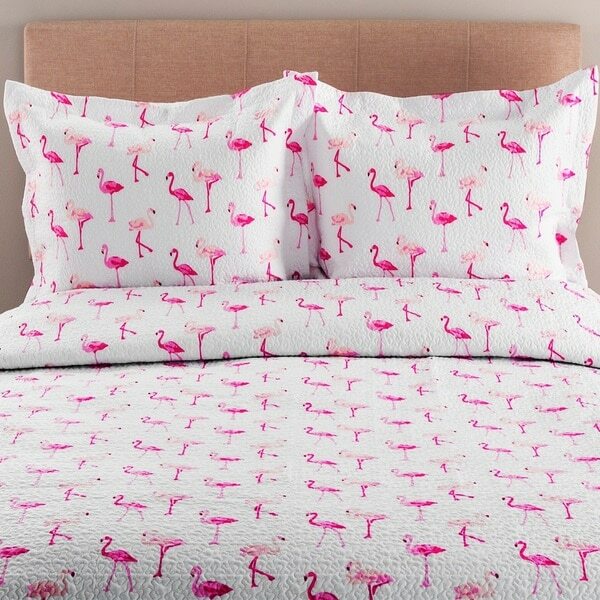 The quilt and matching shams feature a delightful pink flamingo pattern over a white background for a quirky design that will brighten up any room. The soft and trendy set is crafted from machine washable polyester and is quilted all over for an extra cozy, but light feeling you'll love to snuggle under. Bought this for 2 twin beds for in our guest room at the beach. I wanted something a bit "whimsy", and this is just perfect. The product is well made, is lightweight, and has a nice drape to it. Adding microfiber sheets ( in magenta) and a blanket (white) will make it compatible for winter bedding also and help with those "winter beach blues". I also picked a white tiered ruffle bed skirt from overstock today. To complete the look i am going to add a bright green and white striped toss pillow for an accent color, and a pastel watercolor flamingo print for above each bed on the wall. Walls will be painted a brighter green with woodwork painted bright white. Bought this set for a cottage. It looks so cute. Colors are great, well made 3-piece quilt set. It is a very nice summer light weight blanket. This sheet set is so cute! 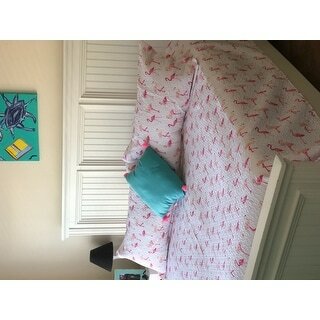 I live at the beach and my guest bedroom & bathroom are done in flamingos. This sheet set tops off my room. Great quality at a great price! Shipped the wrong quilt set. Instead of flamingos I got the Ooo, La, La with the Eiffel Tower. Now it’s out of stock. Bought for a gift. Very disappointed. This is a great whimsical addition to my bedroom. There are matching sheets, but they did not fit my 15 inch mattress. They wouldn't stay on. Love this quilt set and it matches my sheet set. Great quilt, wonderful quality. It is longer then most of the quilts I have had in the past which awesome. It is printed on both sides so can be flipped over for any reason. I love them! And Overstock ensured I'd get great quality blankets for a fraction of what I'd spend in a store. They fit our oversized mattress perfectly. Flamingos! It got good reviews, machine washable and great price point!